These handy notebooks are Party Favors your guests are sure to make note of. Some favors simply stand out from the crowd. These notebooks surely fit right into that category! 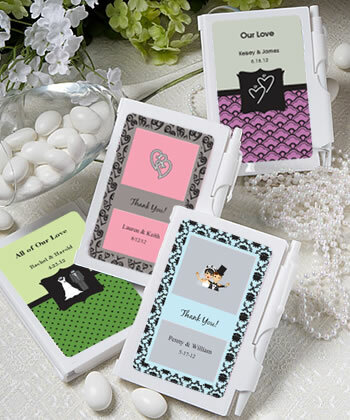 Each cute and practical white notebook favor measures 3.25 x 4.25 and features a cover, designed to display your personalized label, that opens to reveal a blank white notepad inside and an easily accessible white pen attached. From assorted color combinations and exciting border design options, to adorable themed designs that match your occasion, to your own name, date and message, you can personalize your label and make this favor truly your own. Personalized labels are self-sticking for easy application on the notebooks. Guaranteed to be a useful and unique memento of your special day, these favors come bulk packaged...Please allow 3-4 days for production. Design your own Personalized labels that are so easy to add to your Favors. The Custom Designer will fill in the drop-down menus for you. All you have to do is click the blue button and design your label live in our advanced label designer! TIP: Use our Custom Label Designer. The Custom Designer will automatically fill in your selections. Personalized Labels are not attached (some assembly required).